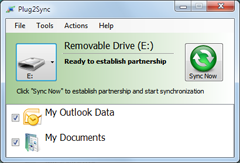 The first Plug2Sync for Outlook version was released. Software to synchronize and backup Windows files and folders via external memory devices. Sync files, folders and Microsoft Outlook without Internet. Two versions available - Free product version and Pro Edition.